Please note: it's not recommended to uninstall and reinstall the HubSpot-Salesforce integration to fix integration issues. If you're encountering suspension errors, sync errors, or other integration issues, search the HubSpot Knowledge Base or attempt to troubleshoot the issue first. If you're still unable to resolve the errors or issues, contact HubSpot Support. In the upper right, click Disconnect. HubSpot contacts created from Salesforce leads or contacts. HubSpot companies created by Salesforce accounts. HubSpot deals created by Salesforce opportunities. HubSpot tasks created by Salesforce tasks or activities. HubSpot contact or company properties in the Salesforce Information property groups. HubSpot properties values added due to a Salesforce field mapping. The HubSpot integration package installed in your Salesforce organization. Select a reason for the integration uninstallation, then enter Uninstall Salesforce in the text field. Reassign your contacts, companies, and deals to HubSpot owners. 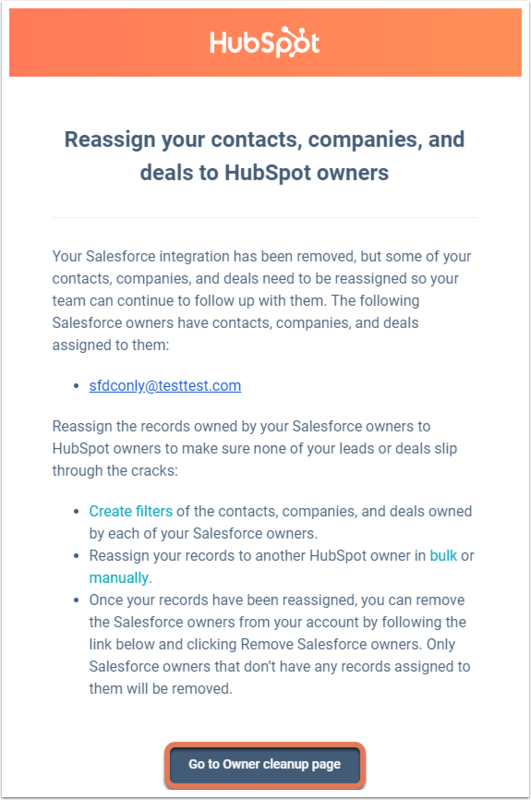 In the email, follow the instructions to identify contacts, companies, and deals currently owned by Salesforce-only users and reassign them to a HubSpot owner. After reassigning your records, click Go to Owner cleanup page. You'll be redirected to the Salesforce integration owner cleanup page in HubSpot. In the upper right, click Remove Salesforce owners. In the dialog box, click Got it. In the left sidebar menu, navigate to Build > Develop > Installed Packages. In the left sidebar menu, navigate to Platform Tools > Apps > Installed Packages. Locate the HubSpot Integration package. In the Action column, click Uninstall. On the next screen, you'll see a list of all the package components and custom objects that will be permanently deleted with the uninstallation, along with any customizations, data, reports, and relationships associated with them. Select Save a copy of this package's data for 48 hours after uninstall or Do not save a copy of this package's data after uninstall. Please note: if you choose not to save a copy of the package data during this step, you will not be able to access or retrieve it later. Select the Yes, I want to uninstall this package and permanently delete all associated components checkbox.